DCI.org's Michael Boo had the pleasure of meeting with John Baumfalk during the last part of the DCI World Championships Quarterfinals on Aug. 9, 2007 in Pasadena, Calif. Baumfalk co-founded the Holy Name Cadets in 1934, was the corps' first drum major and was also the corps' first horn instructor, despite having no formal musical training. They're doing things we never thought of doing, things we wouldn't dare ... We weren't even allowed to march backward. His family relocated to California in the early 1940s, where he instructed a number of corps including Monterey Park Girls and the Commodore Perry Japanese Boy Scouts. He was the latter corps' horn instructor when they won the California American Legion State Championship in the early 1960s. After that victory, the corps went on a one-month tour of Japan and had an audience with Emperor Hirohito. 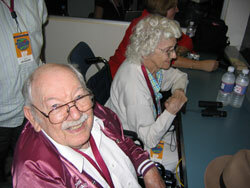 Now a resident of a Los Angeles suburb, Baumfalk looked forward to seeing the DCI World Championships come to southern California since he had not seen the Cadets perform since 1946. During the Cadets' performance Baumfalk said: "This is outstanding. It's breathtaking. This is more than I imagined. The work is incredible. They do an excellent job with company fronts and things like that. "They're doing things we never thought of doing; things we wouldn't dare. A lot of things they're doing now weren't allowed back then. We weren't even allowed to march backward. "There's been a big change for the better. The biggest surprise to me is the music. We used to be limited with G and D (keyed) bugles. You can tell now the sound is so much better. I enjoyed it very much. I think they've come a long way, and I'm excited about the wonderful job all the corps are doing." Mr. Baumfalk eagerly anticipated meeting the members and staff of the Cadets during the corps' breakfast meal on Aug. 11, saying, "I'll tell them to keep up the good work. When I helped start the corps, we couldn't imagine being national caliber, and then we won a National Championship. And now the corps is one of the best in the world. This is a big thrill."